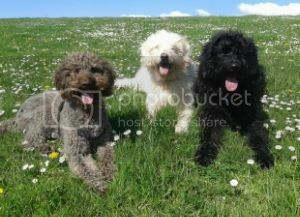 UK Labradoodle Association • View topic - Spaying / Neutering a female dog : Advice? Post subject: Spaying / Neutering a female dog : Advice? I'm after some advice about the best time to spaying my puppy? Some are suggesting to wait after her first season but, others are saying before the season? She is currently 3 months old and was thinking of getting her neutered at 6 months? Also, can anyone advise as to the approx cost of this operation? Post subject: Re: Spaying / Neutering a female dog : Advice? Hi, we spayed Willow at one year old after her first season as suggested by our vet but I know that some vets suggest before. The vets reason was to get one season out of her system and then spay three months after the season. Thanks for the feedback, I will discuss it with our vet at the next visit. I am still inclined to have it done before her first season. v) reduced lifespan in spayed Rottweilers. Thanks for the information. I will do some more reading on the subject before we decide which way to go.